When you meet Jason Iverson, it’s easy to tell that he is a revolutionary in the marine industry. He’s a masterful businessman whose company, Iverson's Design, spans three states and a forward-thinking craftsman whose signature dodger design is the envy of every fabricator on the West Coast. His company vans are hard to miss on the road, with bright graphics that match his enthusiasm and creativity. He’s so confident in his work that he even appears on his website home page standing atop one of his designs in a cape, with lightning bolts in his hands. The truth is, Jason has every right to feel confident. He holds degrees in Industrial Design and Interdisciplinary Visual Arts, has researched and developed a variety of products, including an underwater breathing apparatus and a Microsoft-sponsored, eco-friendly computer keyboard made from carrots. He has won numerous awards, both nationally and internationally, from the Industrial Fabrics Association International, Industrial Designers Society of America and the University of Washington, manages dozens of employees and is always coming up with new ways to market his business. Though his waiting list can be several months long, he has a dedicated crew in place to assemble a new dodger in as little as one week. You can look at an entire marina full of boats and know instantly which ones have been clients of Iverson’s Designs – he’s just that good. Jason also loves to take his show on the road, regularly displaying his work on Iverson’s company sailboat at the Seattle Boat Show and Boats Afloat. 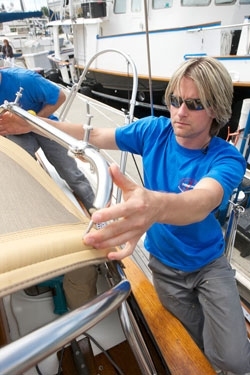 The makeover of the Galatea will show Jason in his element – with yards of fabric in hand, a dedicated crew at his side and a single vision: to create the most breathtaking dodger in the marina. You will see the ins and outs of Jason’s business throughout this makeover project, from the rainy days to the sunny days, the frantic search for the perfect Sunbrella fabric to the dramatic dodger and bimini installations. Though to be honest, we have edited some sections of the video to protect the proprietary nature of Jason’s work. After all, a revolutionary can’t reveal all his secrets. A note to fellow fabricators. Website Maintained by Notable Web, Inc.